You love your job. But there’s a part of your job – like everyone else’s – that doesn’t qualify as “fun”. There are reasons you need to take action at times, and there is a firm that can help you with these times to ease the stress and make a difficult process run smoothly. We’ve been in the employment law business for decades, so if you contact us today we can help you when the time comes. Co-working space opens in former Jamf offices. 10 Local refuse haulers include residential compost. Sadly, I spoke too soon last time. My musings in winter’s edition centered on my first job as a retail clerk in a Madison Shopko and relief that the Wisconsin-based retailer did not plan to close its Chippewa Valley stores at the time. Unfortunately that changed in mid-March when the company expanded its store closing list to include all its locations. More than 100 stores the company had hoped would remain open — including Eau Claire and Lake Hallie — are slated to be liquidated by mid-June. It’s another loss to the local retail market after former stalwarts Kmart, Macy’s, Younkers and Sears all shuttered here in the last five years. It’s a shame to see the decline of so many store chains we grew up with, got paychecks from and swarmed to for our holiday shopping. That underscores how competitive the battle has become for consumers’ dollars. Scraping out a profit margin the traditional way has become tougher in a world where Amazon and other online retailers have established themselves. It’s the nationwide challenge that all brick-andmortar chains are facing. But if there is a small measure of comfort the Chippewa Valley can take in the store closings of the past few years its because of issues with their respective chains — not our area. While the Kmart has remained vacant, other stores have gotten new tenants. Last year Hobby Lobby moved into the former Macy’s at Oakwood Mall. Earlier this year, owners of HOM Furniture bought the defunct Younkers in the same mall. The Minnesota-based furniture store chain hasn’t made its plan for that space known yet, but the fact they bought it indicates they see the location’s potential. A slightly older example of the local market’s health is that after bookstore Borders closed its shops nationwide, Eau Claire’s location was quickly occupied by bookseller BAM! So while the retail sector seen some departures in recent years, the Chippewa Valley also gets new arrivals. GUEST COLUMNS Jeff West . . . . . . . . . . . . . . . . . . . . . . . . . Steve Latham . . . . . . . . . . . . . . . . . . . . .
19 CALENDAR . . . . . . . . . . . . . . . . . . . . 21 BY THE NUMBERS . . . . . . . . . . . . 23 DIRECTORY . . . . . . . . . . . . . . . . . . . . 23 Terri Schlichenmeyer . . . . . . . . . . . . .
Staff photos by Dan Reiland Elaine Coughlin is the community manager of CoLab, in charge of cultivating the environment that tenants want in the co-working space. Her role involves planning events that highlight the local startup business community as well as the dayto-day operation of CoLab. intangible perk of the co-working space. As he prepares to hand over the reins of the co-working space, O’Brien gives Elaine Coughlin a pop quiz on the most important things that CoLab is going for. “Environment, community and culture,” she responds. O’Brien congratulates her on answering correctly. led teams will take ownership of creating and delivering a specific product. “The idea is to give students a broader experience,” he said. Where CoLab fits into that is providing a downtown setting where Clearwater Labs can focus on its business venture away from the stresses and pressures of campus life. Instead of staring at books in the campus library or their dorms, students coming to Clearwater Labs can get views of the downtown businesses on South Barstow Street or gaze out on the Chippewa River from the windows in CoLab’s break room. WESTconsin Credit Union is proud to be a chosen SBA Express delegated lender by the U.S. Small Business Administration (SBA). Our local business loan professionals are experienced, friendly, knowledgeable and ready to serve you and your business needs. Alex Stout of Clearwater Labs uses a desk at CoLab in late February. He and business partner Greylan Larson were “beta testers” of the co-working space, setting up their venture there in January before the facility officially opened in mid-March. He’d seen the concept succeed in larger cities and knew Eau Claire had creative freelancers in need of a place to work. Large tables, a printer, wireless Internet, conference rooms, restrooms and a shared employee break room were among the amenities. Along with that came the intangible benefits – chances to mingle and collaborate with fellow WorkSpace tenants as well as employees in the businesses upstairs. Though there were times when WorkSpace had few clients, Meyer fondly remembers when it was busy with people sharing ideas and working together. “It can be a neat thing when it clicks like that,” he said. But Meyer said WorkSpace was a smaller version of what he’d hoped to see Eau Claire’s co-working scene become. “We knew that our space was a starter for the idea in this community,” he said. At the start of 2018, WorkSpace stopped accepting new users and closed down. The lower level of the building became Volume One’s video production studio. Aware of the plans for CoLab, Meyer deferred to the new co-working space – sharing advice from his experience and spreading word to his former WorkSpace clients of the new place. O’Brien noted that CoLab was intended to be the next step after WorkSpace. “This is the bigger and better version of that,” he said. Meyer has been to CoLab numerous times and said it has the larger space, gathering spots and natural light that co-working spaces should have. “It’s the way that sort of thing should be done,” he said. CoLab is one of the creations of Pablo Properties, a group of early Jamf leaders that has made a name for itself in recent years through downtown redevelopment projects. Their wide-ranging credits include thoroughly renovating an old downtown hotel into The Lismore, making major donations to a downtown arts center, renovating older buildings into new housing and operating a trio of coffee shops. Pablo’s partners are Jamf co-founder Zach Halmstad, and two others who were integral in the software company since its early days, Jason Wudi and Julia Johnson. The idea of CoLab, O’Brien said, is to create more Jamfs and other startup businesses by providing a resource for people with big dreams. O’Brien had contemplated creating his own coworking space last year in Eau Claire when he met with Pablo Properties and learned the company already was cooking up something in that vein. Instead of creating two co-working facilities that would compete for the same pool of users, O’Brien opted to join up with Pablo and the company hired him in October to begin creating CoLab. While most of its resources will be geared toward the tech world, CoLab doesn’t want to be exclusionary. The space would be open to those who want to rent a desk to start another kind of business or for one-time projects, such as preparing tax filings. CoLab’s conference rooms, which are equipped with large TVs and easy-to-use videoconferencing technology, are available for the public to rent for $45 to $60 an hour. Members get some conference room time included with their dues. To learn more about how Prevea can help your employees and business, contact us at (920) 431-1999 or visit prevea.com/results. CoLab’s downtown location is beneficial for Larson and Stout, both UW-Eau Claire seniors, because it gets them away from student life on campus during times when they want to focus on their tech venture. CoLab features 15 dedicated desks with adjustable desktop and small lockers for member who pay a higher price. 20 “hot desks” are large tables with power outlets that any member can drop in and use on a firstcome, first-served basis each day. 24/7 access via smartphone technology that works like an electronic keycard. Small phone rooms for making private calls. Conference rooms with either a 55-inch or 70-inch television and videoconferencing technology. A lounge area with couches and comfortable chairs.  break room and kitchen stocked with coffee A and snacks. Seeking sustainability Staff photos by Dan Reiland Zacharious and Jamie Pappas, owners of Earthbound Environmental Solutions, pose at the company’s compost site in Altoona. Earthbound is the only company in the Chippewa Valley offering curbside organics recycling. divert organic material from ever-expanding landfills seemed like a perfect way to accomplish those goals. The owners elected to collect trash and recycling in addition to organics because they quickly realized it would be easier for customers to get all waste collection services from one hauler, although some clients subscribe to only the composting service. The company also offers seasonal yard waste and Christmas tree pickup. Food scraps and yard waste together make up about 30 percent of what Americans throw away, according to the U.S. Environmental Protection Agency. “Jamie and I have two passions — environmental stewardship and supporting people with disabilities — and proceeding with this model allowed us to pursue both of them,” Zacharious said, noting that the pair both graduated from UW-Stout’s vocational rehabilitation program. Jamie added, “We believe anybody has the ability to work, and we strive to offer employment opportunities to people with mental illness or other disabilities.” Earthbound has five employees in addition to the two owners, who still get their hands dirty by driving routes and managing the compost site. Want a BIT More? From your Business Checking Account? At Charter Bank our Business Bankers take every BIT of your business into consideration to better understand you, your business and your overall goals! What separates Charter Bank from the rest? Our People! Learn a BIT more @ charterbank.bank/business or call 800-471-4510! Indeed, customers should generate very little regular garbage if they’re doing all the composting and recycling possible, Jamie insisted. An Earthbound pamphlet guides customers by listing a surprising number of nonfood items that are compostable, including coffee filters, cork, soiled newspapers and paper towels, vacuum cleaner contents, cotton balls and pet fur. “Sustainability is not just the cool thing to do; it’s the right thing to do,” said Jamie, whose emails end with the slogan “From Curbside to Compost, Saving the World Has Never Been Jacob Johnson of Earthbound Environmental Solutions collects food waste for composting from The Nucleus on Water so Easy! !” Street in Eau Claire. Once Earthbound hauls the organics to offering shared services for start-up companies. The its compost site, workers use heavy equipment to company founders said access to loans and office mix the material and put it into mounds, located space through CVIC and start-up advice through the over a forced-aeration facility built by Jamie. 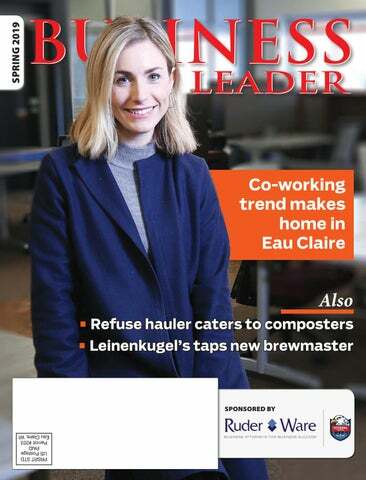 The Eau Claire Area Economic Development Corp. and “cooking” process promotes microbial activity that, the UW-Eau Claire Small Business Development in essence, eats the food, she said. Center played crucial roles in helping Earthbound Even in winter, the natural breakdown process get off the ground. generates temperatures of 150 to 180 degrees, “I think it elevated your professionalism to be keeping the piles from freezing. accountable to stakeholders with high standards,” “The piles are steaming out there even when it’s Zacharious said. super cold,” Jamie said. After three years at CVIC, Earthbound graduated Eventually, the entrepreneurs said they hope to in August and now operates out of a home office sell some of the resulting compost to landscapers and its compost site. or developers interested in the soil conditioner “They just continued to work hard and use and also to donate some to the community garden the resources available to them and now they’ve program to help combat food insecurity. graduated to their own facility,” said Christina Wasson, the former manager of the incubator who now serves as project and marketing manager for the ECAEDC. “We’re very proud of them. They’re doing great.” Wasson said it’s always satisfying to support a Earthbound started as a tenant at Chippewa Valley Innovation Center, an incubator in Chippewa start-up that brings a new service to the community, Valley Industrial Park on Eau Claire’s north side providing residents with more options. STRENGTH IN NUMBERS, STRENGTH IN THE CHIPPEWA VALLEY. Trust the experienced, knowledgeable, and dedicated business banking team at CCFBank. Staff photos by Dan Reiland John Hensley, Leinenkugel's new brewmaster, does his rounds through the Chippewa Falls brewery, checking on machinery and processes that make the company's beer. Hensley, 38, has worked at the local brewery since 2012 and ascended to its top beermaking position in January. Worthy of the name On a typical day, Hensley walks through the plant several times, checks the machines and the beermaking processes, and samples the beers to make sure they are all up to standard. The biggest challenge is “keeping the beer consistent and ensure it is the same, batch to batch,” he said. Hensley easily rattles off facts and figures about the composition and recipes of the beers. “I have a cheat sheet in my pocket, but I’ve learned a lot,” he said. On a daily basis, about eight beers are being brewed in Chippewa Falls. FOR PERSONALIZED BANKING SOLUTIONS In the last year, Merchants was the community bank of choice for more than 8,370 business owners. It’s time to put our expertise to work for you: • Business and equipment finance • Efficient cash management • Cash flow and savings strategies Find out how we’re different. Contact me. Local community decisions. Regional strength. Member FDIC Subject to approval. Before Leinenkugel's, Hensley worked for a decade at Miller Brewing Company in Milwaukee. DON’T LET BACK PAIN IMPACT YOUR PRODUCTIVITY. The brewmaster's job involves testing and sampling beer to make sure it is up to the company's standards and consistent from batch to batch. Chronic back pain is no joke and can have a large impact on your work. Find out how nonsurgical and surgical spine care from Mayo Clinic experts can help you stay at the top of your game. Call 715-598-2623 to schedule an appointment. Your business is growing. You need to borrow money and don’t know where to start. We can make some introductions for you. We know businesses and we know banks. So, whether you’re buying a building, adding on to your own facility or simply need a partner to help in negotiating some contracts, we’ve been in business for 95 years ourselves. Call us today and we’ll help get you where your business is taking you tomorrow. Jeff West is the owner of Bear Down (beardowninc.com), an executive and executive team coaching company based in Eau Claire. He was a founder and CEO of Silicon Logic Engineering. He also chairs Business Partners peer groups in northwestern Wisconsin. West can be reached at: 715-559-2195 or jeffatbeardown@gmail.com. typically say they don’t like ball anymore. It’s interesting to me how many of these kids come in full of enthusiasm only to say a few weeks later they’re not interested anymore – thereby taking away the fear of being emotionally hurt or rejected. But at what cost? If you asked them if they were afraid of the ball, what do you think they would say? Do you see the subtlety of this? When we are asked whether we experience fear, the reasonable answer we tell ourselves is no. That’s fear avoidance. ••• It comes down to how we define winning and losing. Let’s say you’re a golfer, and I have you play a 5-year-old who’s never played before. You win match after match by ridiculous margins. Are you really a winner? If you want to stretch yourself as a leader, and grow a little, look for the things you avoid doing in your business and your life. Are you not doing them because you believe the consequences of embarrassment or being seen as a loser or a failure would be awful? Do you allow your imagination to take over and head straight for the worst possible outcome it can dream of? When we play not to lose, the game is about survival. To survive we need to avoid the awful stuff our imaginations keep playing in our mind like a blockbuster horror movie. We choose not to take risks because we fear what might happen. We play it safe. ••• Playing to win means engaging with life. Look back when you’re old and gray with no regrets. It’s the way to thrive on this adventure we call life! Playing to win means there is no such thing as failure, only learning and growth. Be honest with yourself. Did you sense a little excitement reading about playing to win? What would it be like to track down your hidden fears and slay them? Do you think it could lead to a little more fulfilling life, one you could look back on with pride? Steve Latham is a chartered financial analyst with a master’s degree in investment management and financial analysis from Creighton University and more than 12 years of experience in the finance industry. He is a financial adviser, CIO and a managing partner at River Prairie Wealth Partners, 2423 Rivers Edge Drive, Altoona. He can be reached at 715-832-7715.
instances, the markets moved sideways for a period of time before showcasing an impressive bull market run. From July 1, 2009 to Jan. 1, 2010 the S&P 500 posted a return of over 20 percent. We experienced the second of such occurrences on Dec. 24, 2011 until April 24, 2012 when the S&P 500 grew 11.3 percent. As of early March, the S&P 500 was up just shy of 10 percent. When the market gets whipsawed like it has in these three instances, there’s typically a confluence of factors at work. In 2009 it was the U.S. emerging from the bottom of the Great Recession, and in 2011 it was the U.S. government’s debt experiencing a downgraded rating from Moody’s – both major events in their own rights. In 2018 we saw corporate earnings growth questioned, international tariff rhetoric heightened, and the U.S. Federal Reserve maintaining a tight stance on monetary policy. Fast forward a few months and what do we see? Corporate earnings were largely in-line with expectations last quarter, the U.S. and China have increased communication on tariffs amid broader trade negotiations, and the Federal Reserve has backed off from further tightening measures for the foreseeable future. They’re all positive tones in an environment that seemingly had none only a short time ago. A final statistic to ponder: Since 1938 there have been 30 years where both January and February were positive to start the year. The average return within each of those years was 20 percent. This year happens to have experienced the fifth strongest two-month start to a year ever, and its best start since 1987. When we look to history to help us predict a path forward for the markets, it’s always important to keep in mind the timeless adage “past performance is not indicative of future returns.” While there are no absolutes in life, we can still look to the past to gather clues about current market conditions based on patterns we’ve seen repeat themselves throughout history. Even with this optimistic outlook for the year, we still encourage diversification within investment portfolios to help ensure prudent risk management based upon your goals. April - June April 2: Building Employee Accountability — The Critical Role of Leadership, 1-4 p.m., Room 118, CVTC Chippewa Falls Campus, 770 Scheidler Road. Cost: $89. Info/register: cvtc.edu. This class will be repeated at 9 a.m.-noon on April 10 in Room 109 at CVTC’s Neillsville Campus, 11 Tiff Ave., and on April 17 at the St. Croix Valley Business Innovation Center, 1091 Sutherland Ave., River Falls. April 3: Human Resource Conference, 8 a.m.-2:30 p.m., The Florian Gardens, 2340 Lorch Ave., Eau Claire. Cost: $89 for Eau Claire Area Chamber of Commerce or Chippewa Valley Society for Human Resource Management members, $119 for nonmembers. Info/register: EauClaireChamber.org. April 3: Starting Your Business Plan workshop, 6:30-8:30 p.m., Red’s Mercantile, 224 N. Dewey St., Eau Claire. Suggested donation: $10. Info: RedLetterGrant.org. April 3: Strengths-Based Leadership, 8 a.m.-noon, Room 125, CVTC River Falls Campus, 500 S. Wasson Lane. Cost: $149. Info/ register: cvtc.edu. This class will be repeated on May 14 in Room 100A at CVTC’s Business Education Center, 620 W. Clairemont Ave., Eau Claire. April 4: Developing a Leadership Voice, 8 a.m.-noon, St. Croix Valley Business Innovation Center, 1091 Sutherland Ave., River Falls. Cost: $129. Info/register: cvtc.edu. This class will be repeated on May 1 in Room 130 of CVTC’s Manufacturing Education Center, 2320 Alpine Road, Eau Claire. April 4-5: Orientation, Time Management and Delegation (a course in the Supervisory Management Certificate Program), 8:30 a.m.-4 p.m., Holiday Inn South, 4751 Owen Ayres Court, Eau Claire. Cost: $600. Info/register: ce.uwec.edu. This class will be repeated on April 25-26 at Citizens State Bank, 375 Stageline Road, Hudson. April 5: Success for Breakfast — Your Energy Story, tips from a life coach on managing professional and personal lives, 9-10 a.m., Chippewa Falls Area Chamber of Commerce, 1 N. Bridge St. Cost: $15 for chamber members, $20 for nonmembers. Info/register: ChippewaChamber.org. April 9: Build Productive Teams [by Leveraging DiSC], 9 a.m.noon, St. Croix Valley Business Innovation Center, 1091 Sutherland Ave., River Falls. Cost: $99. Info/register: cvtc.edu. This class will be repeated at 8-11 a.m. on April 11 at CVTC’s Applied Technology Center, 2322 Alpine Road, Eau Claire. April 10: Leading with Emotional Intelligence, 1-5 p.m., Room 117, CVTC Chippewa Falls Campus, 770 Scheidler Road. Cost: $139. Info/register: cvtc.edu. Save $150 Off * Closing Costs Access your equity today! Want to learn more or look at other options? Give us a call at 800-341-9911 ext: 7251 to speak with a Mortgage Loan Specialist! ► rcu.org/HELOC *APR=Annual Percentage Rate. APR may vary. For qualified borrowers only. Must use promo code HELOCSpring. Rates shown are for up to 70% TLTV for borrowers with 700+ credit score. The maximum interest rate of 18% may be imposed in a variable-rate plan. Finance charges of $150 may be imposed. Manufactured homes and vacant land qualify for 80% financing. All other traditional homes may qualify for 100% financing. Certain exceptions may apply. Rates current as of 3/15/19. Last changed on 12/21/18. Insured by NCUA. | Equal Housing Opportunity. 24 percent Of more than 11,500 employers surveyed in the U.S. expect to add positions during this quarter, based on data from the ManpowerGroup. Meanwhile 72 percent plan to make no change to staffing, 3 percent will shrink ranks and 1 percent were undecided. $187.2 million Value of construction projects that took out building permits during 2018 in Eau Claire. This is the third-largest figure in city history, coming off the record high of $295.6 million set in 2017. 120 Stores Shopko had hoped would stay open through its Chapter 11 bankruptcy, but will instead be liquidated in coming months. 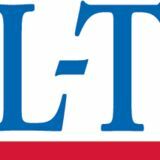 The Green Bay-based retailer announced on March 18 that all of its stores would be closing, including locations in Eau Claire and Lake Hallie. 2.9 percent Wisconsin's unemployment rate for February, which was below the nation's 3.8 percent average. The Veterans Tribute Trail is a community project that will be a lasting legacy for generations to come. The purchase of a Legacy Stone is a vital investment in the preservation of a rich history of service to our country. Our HISTORY. Our COMMUNITY. Our VETERANS. Family and Business Sponsorship Opportunities are available.